When travelling with any pet it is advisable to have all vaccinations up to date and to be aware of what is available in the way of preventative medications for your pet. When booking a foreign trip that involves the family pet make sure that his passport details are up to date. Remember you also need to know where to have his inoculation for ticks and parasites before he can return into the UK after your trip. This is to ensure that foreign parasite and ticks are not introduced into the country. It pays for your pet to have a check up at the vets before making any long journey. If you are in doubt about your pet's health leave him at home. Always carry details of any medication your pet is taking as the information may be needed while you are away from home. It is quite common these days for pet owners to treat their dogs homoeopathically. There are even nosodes that replace the yearly vaccines that have traditionally been administered to our animals. These nosodes also cover parvo virus. However, when travelling abroad pet owners have no choice but to follow the traditional route and visit their veterinary clinic for the more regular vaccinations. There are homeopathic pills for all ailments; a popular one is for kennel cough. 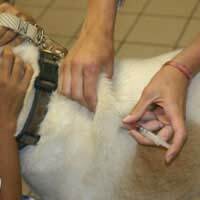 Many people are now finding that it is not necessary to bombard their pet's bodies year after year with booster vaccines. If you have any doubt about this ask your vet for a blood test to determine if your pet needs his booster injections. After the age of seven years it is hardly likely for your dog to need another booster. However you may need documented proof of this if you ever intend to put your animal into kennels as most kennel owners insist on a certificate showing that the pet has had all vaccinations and that they are up to date. Glucosamine and Chondroitin Sulphate:Used for dogs (and owners) that are getting stiff joints due to age and joint problems. Cod Liver Oil/Flax Oil:Again, very good for joints and also coats. For urinary problems cranberry pills are often used and garlic capsules are popular to ward off fleas. Valerian for calming dogs whilst travelling is popular amongst dog owners. Many vets are happy to discuss complementary therapies that will aid a pets return to health but remember you have a duty of care to your pet and this includes taking them to a veterinary clinic when they are unwell. Some animals have an aversion to taking pills and can hold one in their mouths for ages before letting it drop to the floor. Hiding it in their food bowl never seems to work, as they are clever at eating around the offending item. A way to beat the fussiest of pets is to hide the pill inside a tasty treat. This may be a piece of cheese or perhaps a rolled up portion of minced meat. Never let the animal see you preparing the medication as they seem to know you are tricking them and try not to let your fingers be contaminated with the smell of the pill as the animal will back away from you.If all else fails crust the pill to powder and mix it with a peanut butter, smear this inside their gums - they have no choice but to lick it off.